USES: Terazosin is used alone or in combination with other drugs to treat high blood pressure. It works by relaxing blood vessels so blood can flow more easily. Lowering high blood pressure helps prevent strokes, heart attacks, and kidney problems. This medication is also used to treat an enlarged prostate (benign prostatic hyperplasia or BPH) in men. Terazosin does not shrink the prostate, but it helps relax the prostate and bladder neck muscles to improve urine flow and emptying of the bladder. It also reduces other symptoms such as excessive urination at night. 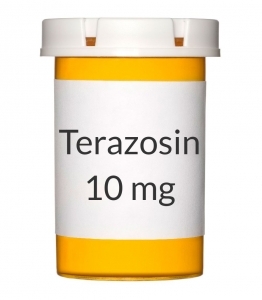 Terazosin belongs to a class of medications called alpha-blockers. OTHER USES: This section contains uses of this drug that are not listed in the approved professional labeling for the drug but that may be prescribed by your health care professional. Use this drug for a condition that is listed in this section only if it has been so prescribed by your health care professional. Terazosin may also be used to help your body "pass," or get rid of, kidney stones through urination. It has also been used to help treat bladder problems in women. HOW TO USE: Take this medication by mouth, usually once daily at bedtime or as directed by your doctor. If stomach upset occurs, you may take it with food or milk. Dosage is based on your medical condition, use of other medications, and response to therapy. If you are taking this drug for the first time, do not take more than 1 milligram to start. To avoid injury related to dizziness or fainting, take your first dose of terazosin at bedtime. Your dose may be gradually increased. You should take your first new dose at bedtime when your dose is increased unless directed otherwise by your doctor. Take this medication regularly in order to get the most benefit from it. Remember to take it at the same time each day as directed. Do not stop taking this medication without consulting your doctor. Some conditions may become worse when the drug is suddenly stopped. Your dose may need to be gradually decreased. If you have not taken this medication for several days, consult your doctor or pharmacist before restarting it. Follow your doctor's instructions carefully. If you are taking this medication for high blood pressure, it is important to continue taking this medication even if you feel well. Most people with high blood pressure do not feel sick. Inform your doctor if your routine blood pressure readings increase. If you are taking this drug for an enlarged prostate, it may take four to six weeks before you notice the full benefit of the drug. Inform your doctor if your condition persists or worsens. SIDE EFFECTS: Fatigue, nausea, drowsiness, blurred vision, headache, or stuffy nose may occur. Lightheadedness or dizziness upon standing may also occur, especially after the first dose, and shortly after taking the drug during the first week of treatment. To minimize dizziness and the risk of fainting, get up slowly when rising from a seated or lying position. If dizziness occurs, sit or lie down. If any of these effects persist or worsen, notify your doctor or pharmacist promptly. Remember that your doctor has prescribed this medication because he or she has judged that the benefit to you is greater than the risk of side effects. Many people using this medication do not have serious side effects. Tell your doctor immediately if any of these unlikely but serious side effects occur: fainting, fast/irregular heartbeat, burning/tingling in the hands/feet, sexual function problems, swelling of the ankles/hands/feet, unexpected weight gain. Tell your doctor immediately if any of these rare but serious side effects occur: easy bruising/bleeding, mental/mood changes. For males, in the very unlikely event you have a painful or prolonged erection lasting 4 or more hours, stop using this drug and seek immediate medical attention, or permanent problems could occur. A very serious allergic reaction to this drug is unlikely, but seek immediate medical attention if it occurs. Symptoms of a serious allergic reaction may include: rash, itching/swelling (especially of the face/tongue/throat), severe dizziness, trouble breathing. This is not a complete list of possible side effects. If you notice other effects not listed above, contact your doctor or pharmacist. In the US - Call your doctor for medical advice about side effects. You may report side effects to FDA at 1-800-FDA-1088. In Canada - Call your doctor for medical advice about side effects. You may report side effects to Health Canada at 1-866-234-2345. PRECAUTIONS: Before taking terazosin, tell your doctor or pharmacist if you are allergic to it; or to other alpha-blockers (e.g., doxazosin, prazosin); or if you have any other allergies. This product may contain inactive ingredients, which can cause allergic reactions or other problems. Talk to your pharmacist for more details. Before using this medication, tell your doctor or pharmacist your medical history, especially of: low blood pressure/fainting, prostate cancer, other prostate/bladder problems, liver disease. This drug may make you dizzy or drowsy. Do not drive, use machinery, or do any activity that requires alertness until you are sure you can perform such activities safely. You should avoid driving or hazardous tasks for 12 hours after the first dose, after your dose is increased, and when this medication is restarted after it has been stopped. Limit alcoholic beverages. To reduce the risk of dizziness and fainting, caution is advised when standing for long periods. Avoid getting overheated during exercise or hot weather. If dizziness occurs, sit or lie down. Before having surgery (including cataract eye surgery), tell your doctor or dentist that you are taking this medication. Caution is advised when using this drug in the elderly because they may be more sensitive to its effects, especially dizziness and fainting. This medication should be used only when clearly needed during pregnancy. Discuss the risks and benefits with your doctor. It is not known whether this drug passes into breast milk. Consult your doctor before breast-feeding. DRUG INTERACTIONS: Your healthcare professionals (e.g., doctor or pharmacist) may already be aware of any possible drug interactions and may be monitoring you for it. Do not start, stop or change the dosage of any medicine before checking with them first. Before using this medication, tell your doctor or pharmacist of all prescription and nonprescription/herbal products you may use, especially of: drugs to treat erectile dysfunction-ED or pulmonary hypertension (e.g., sildenafil, tadalafil), medications for high blood pressure (e.g., verapamil), other alpha-blockers (e.g., alfuzosin, tamsulosin). If you are also taking sildenafil and your dose is more than 25 milligrams, you can reduce your risk of fainting by taking your doses of sildenafil and terazosin more than 4 hours apart. Consult your doctor or pharmacist if you have any questions. Tell your doctor or pharmacist if you also take drugs that may lower blood pressure, cause drowsiness or urination problems such as: certain antihistamines (e.g., diphenhydramine), muscle relaxants (e.g., carisoprodol), narcotic pain relievers (e.g., codeine, morphine), psychiatric medicines (e.g., phenothiazines such as chlorpromazine, or tricyclic antidepressants such as amitriptyline). Check the labels on all your medicines (such as cough-and-cold products, diet aids, NSAIDs such as ibuprofen, naproxen) because they may contain ingredients that could make you drowsy or dizzy, or increase your heart rate or blood pressure. Ask your pharmacist about the safe use of those products. This document does not contain all possible interactions. Therefore, before using this product, tell your doctor or pharmacist of all the products you use. Keep a list of all your medications with you, and share the list with your doctor and pharmacist. OVERDOSE: If overdose is suspected, contact your local poison control center or emergency room immediately. US residents can call the US national poison hotline at 1-800-222-1222. Canadian residents should call their local poison control center directly. Symptoms of overdose may include: severe dizziness, fainting. NOTES: Do not share this medication with others. Laboratory and/or medical tests may be performed periodically to monitor your progress or check for side effects. Consult your doctor for more details. If you are taking this medication for high blood pressure, it is important to have your blood pressure checked regularly. Learn how to monitor your own blood pressure. Lifestyle changes such as stress reduction programs, exercise, and dietary changes may increase the effectiveness of this medicine. Talk to your doctor or pharmacist about lifestyle changes that might benefit you. MISSED DOSE: If you miss a dose, take it as soon as you remember. If it is near the time of the next dose, skip the missed dose and resume your usual dosing schedule. Do not double the dose to catch up. Ask your doctor what you should do if you miss 2 or more doses. STORAGE: Store at room temperature between 68-77 degrees F (20-25 degrees C) away from light and moisture. Do not store in the bathroom. Keep all medicines away from children and pets. Capsules stored at higher than recommended temperatures may soften or melt. Do not flush medications down the toilet or pour them into a drain unless instructed to do so. Properly discard this product when it is expired or no longer needed. Consult your pharmacist or local waste disposal company for more details about how to safely discard your product.